my new salt and chocolate obsession all started with a trip to napa and a visit to the Dean and DeLuca store in st helena. my husband and i ordered a coffee and of course had to munch on something sweet, so we ordered a chocolate chip cookie. we were pleasantly surprised to find the bottom of it had a yummy salted butter taste. so i have been experimenting with a cookie recipe to recreate that wonderful taste bud experience (i’ll post it later). 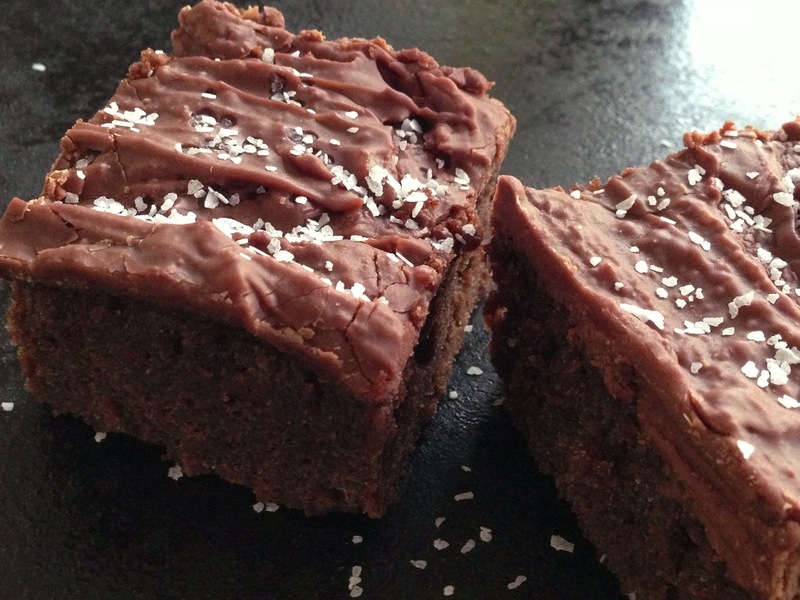 so in the meantime, i came up with this wonderful brownie recipe that i topped with kosher salt. if you want to get fancy, try other gourmet salts…after the holidays, we are on a strict budget so i only had morton’s kosher salt in my cupboard. the salt appears to be a taste thing, and daughter doesn’t care for it and my son loves it. the brownies are yummy either way. in my opinion the salt enhances the chocolate and tones down the sweetness. thanks for visiting and enjoy your brownies! cream butter and sugar; add eggs and blend well. mix all dry ingredients in a bowl and add to the sugar mixture. mix well. add vanilla and chocolate syrup and mix until blended. pour into grease and floured 9 x 13 inch pan and bake at 350 degrees for 35-40 mins. bring sugar, milk, and butter to a full boil. remove from heat. add chocolate chips and vanilla, beating until chips melt. add chopped nuts and then spread icing over cooled brownies. now i would add the salt before serving since the kosher salt will dissolve into the brownies. so sprinkle the salt on top and enjoy.